1. 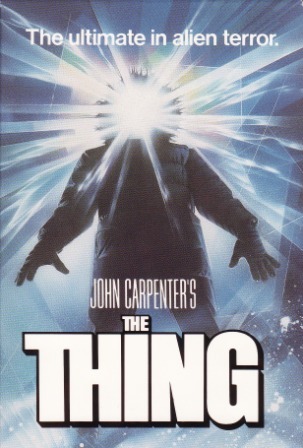 The Thing – Either the 1951 original or the 1982 remake will do nicely, though—over time—I’ve come to prefer the John Carpenter version. It plays out like a scarier, gorier variation of Agatha Christie’s Ten Little Indians set in sub-zero temperatures in an Arctic research station. The nifty twist here is that the “killer” can move from one person to another, which makes identifying it rather difficult. It’s a real chiller—in more ways than one. 2. The Fearless Vampire Killers – Roman Polanski’s delightful mix of comedy and horror has all the ingredients of a traditional horror film: a snowy Transylvanian setting, attractive women in low-cut attire, a Gothic castle, garlic hanging from the ceiling of a tavern, and a well-prepared vampire hunter. To this mix, Polanski adds a dash of the unexpected: a bumbling lovestruck assistant, a Jewish vampire, a gay vampire, and a darkly humorous ending. 3. Where Eagles Dare – Set in the white-covered mountains of Austria, Where Eagles Dare sends seven special forces soldiers to rescue a U.S. general being held captive by the Nazis. 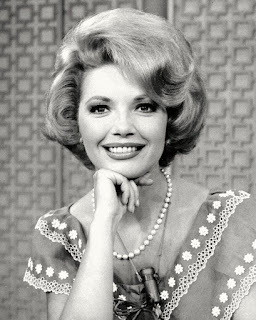 But this is no routine mission: the soldiers must break into an impregnable mountaintop castle, there appears to be a traitor among them, and their squad leader seems to trust no one—except Mary, the blonde agent hiding in the barn. Who would have thought that Richard Burton and Clint Eastwood would’ve made such a good team? 4. 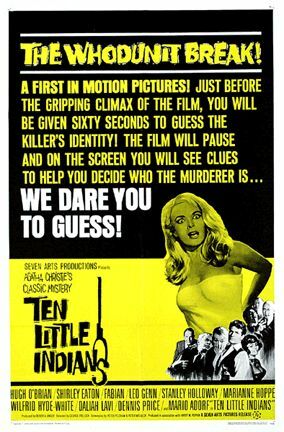 Ten Little Indians – Most film buffs prefer the earlier version of Agatha Christie’s And Then There Were None…but it didn’t trap the murder suspects with the killer in a chateau atop a snowy mountain. Yes, there are distractions, including the dreadful theme music and an over-the-top performance by then-popular singer Fabian (at least, his screen time is brief). On the plus side, the rest of the cast—including Shirley Eaton and Wilfred Hyde-White—does a fine job. Plus, there’s a “murder minute” at the climax, in which an onscreen clock counts down from 60 seconds as key clues are shown again. 5. On Her Majesty’s Secret Service – This 007 film might rate higher, except that it’s only partially set in Blofeld’s mountaintop fortress. Yes, fans quibbles about George Lazenby’s performance as Bond (personally, I think he’s decent), but OHMSS boasts a spectacular setting, the marvelous Diana Rigg, and the first of many thrilling James Bond ski chases. 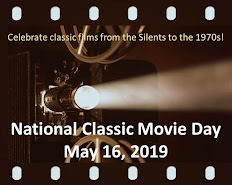 Honorable mentions: the Eli Wallach-Robert Culp sci fi film A Cold Night’s Death; Rock Hudson as a sub commander headed to Ice Station Zebra; and the documentary Conquest of Everest. What would be on your best list for movies to watch on a snowy day? 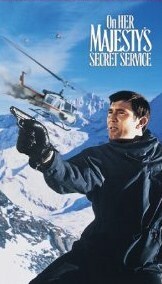 You've got my favorite movie with a snowy setting in the number one spot! That's one of the more intense ones, as the characters can't even stay outside for very long for fear of freezing to death. My wife likes The Beatles' snowy hideout in the Austrian Alps in HELP!, and I really like the cold winter surrounding everything in Bob Clark's A CHRISTMAS STORY. Movies with snowy settings make me feel cold no matter the weather outside, so I can watch them all year round! Another stellar Top 5 list, Rick! Enjoyed your post! You could mention 'Dr. Zhivago,' which has snow and ice up to the eyebrows, but personally I find it a dull movie, even for long winter nights. However, as a choice out of left field, I would mention the 1941 George Cukor film 'A Woman's Face,' starring Joan Crawford; it may not be the 1st winter film to come to mind, but it takes place in the snowy Swiss mountains, has an interesting suspense plot, and features a terrific chase-by-one-horse-open-sleigh through the snow drifts at the end. And Joan gets to wear a lot of fashionable furs and winter booties, so it's got the couture angle covered! Rick, one might almost prefer to reverse your plan of watching snowy films in the heat of the summer and seeing summer films in the chill of the winter. I enjoy this list of films very much but agree that Sark has a point about all the Christmas favorites that would fit well here, too. "The Thing" is quite suspenseful. One does wonder why everyone doesn't just stay together in this and other horror films but that would make it much more challenging for the writers. "The Fearless Vampire Killers" is very atmospheric and tongue in cheek. "Where Eagles Dare" may be my favorite on the list because of its isolated setting and winter restrictions. And you are right: Clint and Richard are surprisingly good together. "Ten Little Indians" is a great isolated setting and a wonderful story. I remember reading "And Then There Were None" in grade school and figuring out who each and every victim would be and who the killer was. I was very pleased with myself! "On Her Majesty's Secret Service" was extra enjoyable because of Diana Rigg and the snowy setting with Blofeld's fortress. Loved this blog! Agree with the THING, definitely. How about DEATH HUNT, THE SHINING, ALIVE, and RAVENOUS? Rick, love the way you do well-described, yet pithy (as you know, I love that word --LOL) little reviews, with humor too! I will always love the original Thing, but I agree that the Carpenter remake is spectacular, and makes me feel really cold. I haven't seen Fearless Vampire for a long time, but I know I liked it - great description of the typical low-cut dresses and of course Polanski's trademark unusual things like a Jewish vampire - is a Jewish vampire stopped by a cross, or do you have to use a Star of David? LOL! The Bond I have not seen, and believe it or not I have not seen Ten Little Indians -- just the original. I have to get that one. Really fun article! Wow, what excellent comments and additions! I just saw DAY OF THE OUTLAW for the first time a couple of months ago and admit it's one of the "coldest" movies I've ever seen. DEATH HUNT made me think of another Mountie movie: Errol Flynn's NORTHERN PURSUIT. A CHRISTMAS STORY and DR.ZHIVAGO warranted an honorable mention (though I'm not a big fan of the latter, either). Becky, FEARLESS VAMPIRE KILLERS is always a perfect choice for a snowy evening. Toto, the opening sweeping shot in WHERE EAGLES DARE always gives them shivers. And, Sark, I never would have thought of HELP!, which was a nifty addition. Don't forget Hitchcock's "The Lady Vanishes" (1938) People stuck in a chalet, train delayed because of an avalanche ... Great film even though it's not snowy through the whole thing.